Is it a caravan? Is it a camper? Maybe Jawa have taken the best of both and fitted them into a small package that a lot of people will love. So say the judges who saw the Trax 12 at Mudgee. 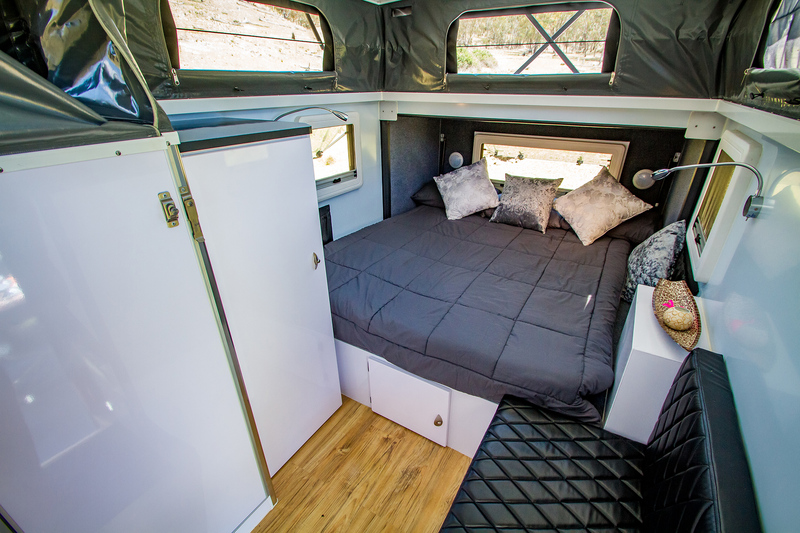 This RV impressed with its comfortable living, which manages to be a priority without impacting upon this hybrid’s ability to abandon the blacktop. Jay and Wayne from Jawa have put a fair bit of time and thought into this latest Trax 12 and it shows. The Trax 12 is a pocket rocket of a hybrid, with an internal ensuite complete with shower and cassette toilet, a light and airy interior, and a long list of inclusions for the $45k price tag. These include but are not limited to a 2.2kVA Honda generator, Duetto hot water system, 95L Evakool dual zone fridge/freezer, portable grey water tank, and a Truma Aventa air conditioner. All these items equal some really good home comforts for a couple wanting to tour in something compact, but without having to deal with canvas. The body and chassis is assembled in China, with the wiring and plumbing done locally. It has a steel frame and aluminium composite wall panels, with a solid fibreglass roof and front. The roof is slightly curved to stop water pooling and assist with run-off. Underneath is a 150x50x4mm hot dipped galvanised chassis and drawbar, and independent trailing arm coil spring suspension with dual shocks. The underbody has been coated with a deadener to protect the chassis and drawbar, and the two 100L water tanks are shrouded by a checkerplate bashguard. We were impressed by the addition of foam padding around the gas pipes that run through the chassis – a clever idea designed to stop vibrations and subsequent damage to the pipes. There’s 16in rims with 267/75R16 mud terrain tyres and all this is pulled up by 12in electric drum brakes. At 12ft long, the camper will travel nicely behind your tow tug, although you’ll need to think twice before heading down tight tracks. The chassis and drawbar are backed by a five year structural warranty, with a one year warranty on the other components. At 1800kg Tare and with an ATM of 2400kg, there’s a decent payload to play with and you should be able to find a home for most items. 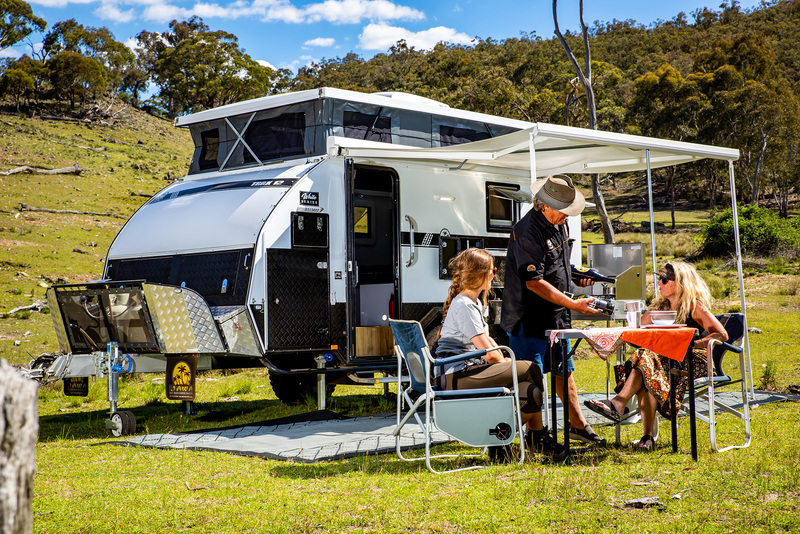 The Jawa Trax 12 White Series presents a hybrid camper jammed with features that lift it to the level of a very good package, with lots of ‘options’ included as standard fittings so that you can place the one order and figure you’re getting just about all you’ll need. 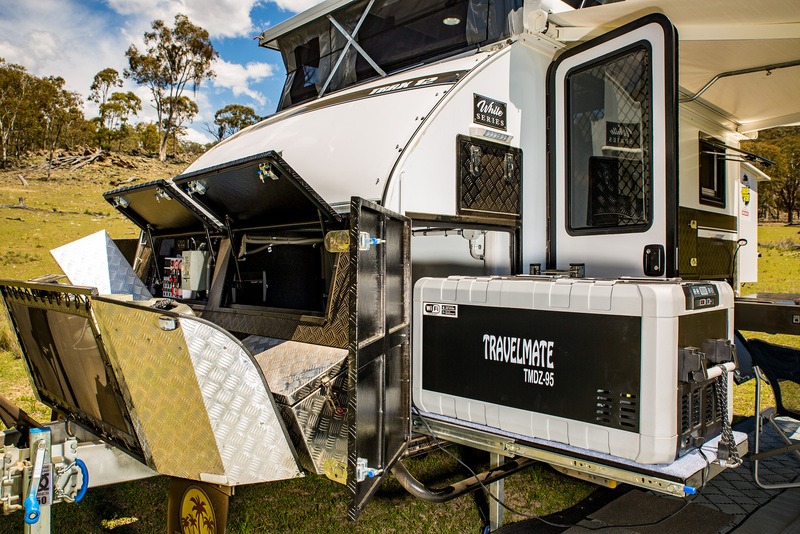 The White Series version of the Trax 12 includes, with some upgraded options, such niceties as two 150W roof mounted solar panels, gas continuous hot water heater, vinyl stoneguard, outdoor speakers, manual awning and anti-flap kit, Travelmate 95L fridge, Truma air conditioning, 2kVA generator and lots of little touches – all currently for $45,000. 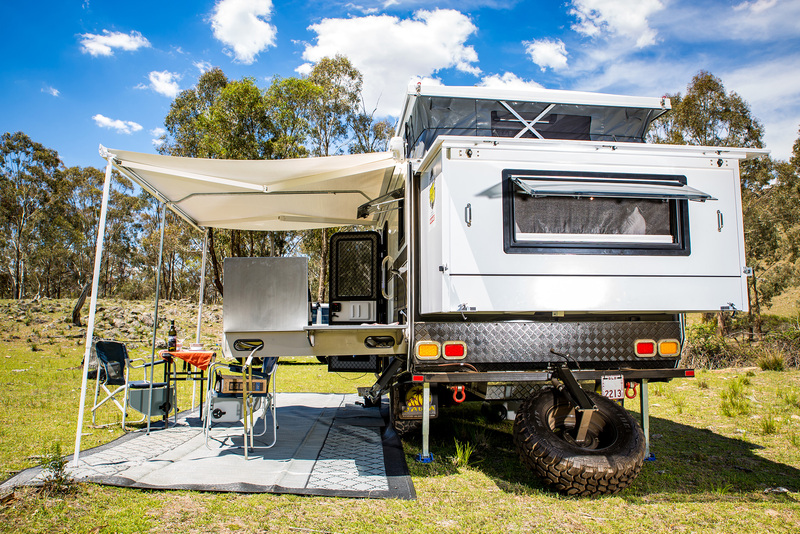 The awning has plenty to offer, including a wall kit which extends past the fridge at the front and to the back of the extended bed at the rear, and has a central brace to ensure that it’s sturdy and well drained. 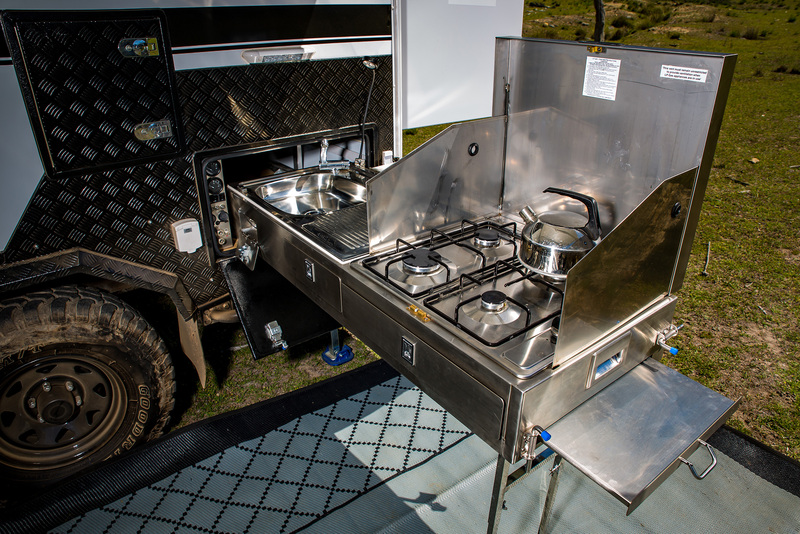 The stainless kitchen includes a sink, four-burner cooker, two drawers and both slide-out and fold-over extensions; and while it has ample wind shielding, it does require a fold-down leg for support. There’s a wall-mounted LED light bar and a stalk light. Next to the kitchen are your water tank gauges, cigarette and USB plugs, and circuit switches, just behind a small pantry inset into the side wall. The bed folds out of the rear quickly and easily, the spare wheel pivoting on the rear supported by sturdy gas struts. It can all be easily handled by pretty much anyone. This extends the bed to a queen size innerspring and opens the interior out to comfortable proportions, with an ensuite with shower and toilet also adding to that comfort. The internal cabinetry is all metal, which makes it more appealing than a wooden version, and the all-white finish adds to the feeling of roominess. The small vanity unit under the benchtop will appeal to many. With a stereo included, and 22in TV as an option, you’re set up to enjoy life on the road. The Jawa Trax 12 White Edition stands out from the crowd partly because of its bright white paint job. And once you spy the air conditioner sitting on the roof, you know you are going to be assailed by a camper with the lot. Inside, the presentation is just as impressive, with clean white surfaces giving a bright airy feel. 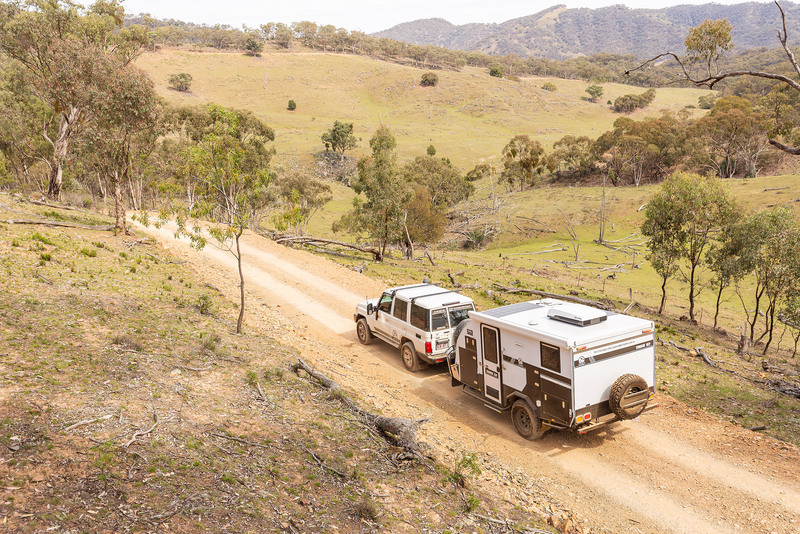 This unit comes out of China – like many these days – but the build quality looks pretty reasonable and certainly better than what campers and vans were exhibiting just a few short years ago. We crawled around underneath this unit (like we did with all of the REDARC CTOTY contenders), checking on welding, finish, wiring, plumbing and fitting. Likewise, we checked in cupboards and under beds for signs of poor build quality and unfinished business. In all, the Trax 12 came out with hardly a blemish on its name. 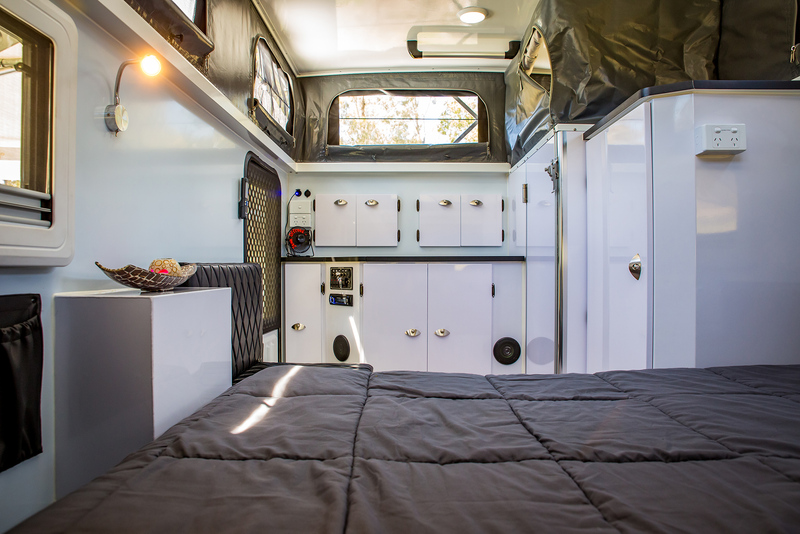 You may see other hybrid campers that look strikingly similar to this one, but what makes this stand out is not only the impressive list of high quality components, but also the effort that has gone into making this unit a live-off-the-grid rig. For a price of 45 big ones, that includes a Honda generator and a host of other accessories. You couldn’t go far wrong. The Trax 12 features a steel frame aluminium composite panel body, with a rather unique one-piece fibreglass roof and a similar constructed main front panel. The wooden floor has an alloy sheet to protect it and all this structure sits on a gutsy 150x50x4mm hot dipped fully galvanised chassis. To protect the underbody and chassis even further, each trailer is sprayed with underbody sound deadener. 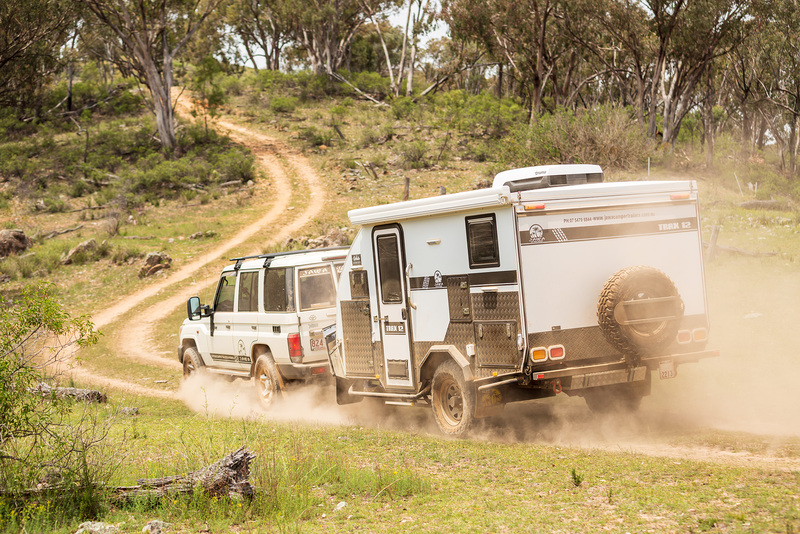 An independent trailing arm suspension backed up by coil springs, with twin shocks to dampen the corrugations and potholes, is pretty much standard fare these days on most campers, so this rig does not lose out to anyone. It also ensures a good ride over all terrain. Tapered stub axles carry 16x8 inch wheels and tyres, while electric 12 inch brakes help them to stop. 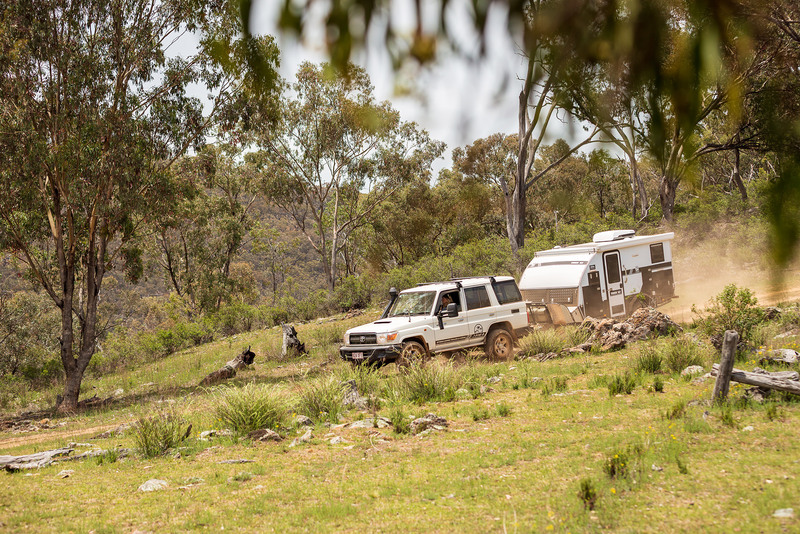 An Ark XO Extreme offroad ball coupling keeps everything connected, while an Ark XO heavy-duty jockey wheel, rated to carrying 750kg, supports the front end when the trailer is disconnected from the tow tug. Four wind-down stabiliser legs are also standard, while, behind the mesh stoneguard, a pair of gas bottles and two jerrycans reside. The single spare wheel mounts at the rear on a gas-strut assisted fold-down bracket that makes the job of dropping it down and lifting it up pretty straightforward and easy. 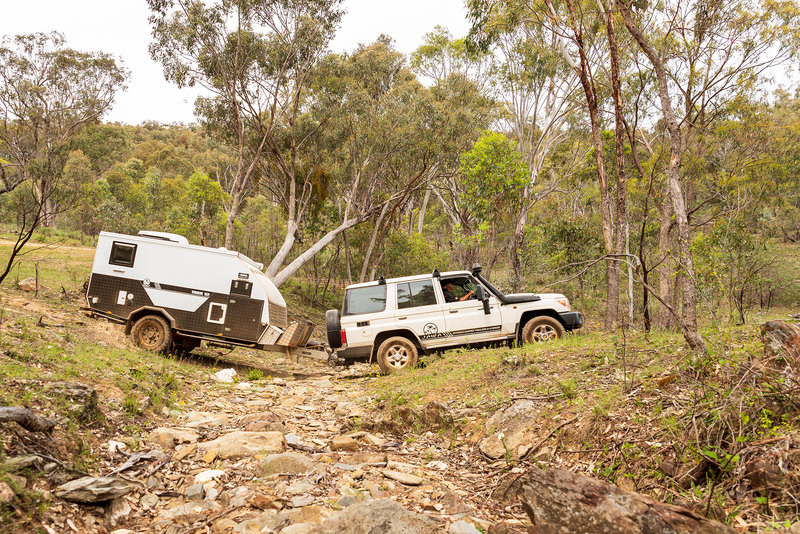 This camper is no lightweight with a Tare of 1800kg. Still, it has an impressive load carrying capacity of 600kg, more than ample for two people – which this rig is really designed for. At last year’s event we called the Jawa Trax 12 the ‘missing link’ between budget priced campers and high-end hybrids. Their offering at the time was the family-style Trax 12 White Series, with its convertible internal dinette and fold-down bunk for the kids. They returned with this year’s contender that had the internal ensuite layout, which has proven so popular with those couples who like the privacy and convenience of their own amenities. But keeping the essentials up to the bathroom and kitchen, plus keeping the lights on and electricals running, requires good power storage and generation, as well as plenty of water and gas. Feeding the shower and hot/cold water taps are two underbody 100L stainless steel water tanks with full shrouding, filters and individual gauges fed by strong pressure pumps. There’s an added external shower for those who prefer a good dose of nature. Out in front are two 8.5kg gas bottle holders, plus room for two added jerry cans that can carry either fuel or that precious water. The gas plumbing is fully certified and compliant, and includes a regulator and quick connect fittings. It feeds to the four-burner gas stove and Duoetto 12/240 hot water system. The electrical system starts with a pair of 100 amp deep cycle batteries kept charged either by the Anderson plug connector to the towing vehicle, a Projecta 240 volt multi stage charger, or the 300 watt roof-mounted solar panels. It is worth noting that Jawa actually use expandable foam through body channels for all of the electricals to eliminate any possibility of rub through. This is one of the sure signs that the range has matured with experience. The pièce de résistance is the Truma Aventa air conditioner mounted up on the roof panel. Whilst it does increase the clearance height you will be thankful for its inclusion in Australia’s climatic extremes. Mounted conveniently on the face of this cabinetry are 240 and 12 volt power outlets, digital display volt, amp and water gauges, a complete CD/MP3/USB/radio stereo system with twin speakers, and a fused switch panel for the multitude of appropriate LED lighting (including exterior and interior illumination, plus overhead and reading lights). There are multiple internal and external 12 volt and USB outlets to keep all the toys fired up.